Produced by Lady Strong’s Bonfire & Soap Soup Theatre. Performers: Tomasin Cuthbert & Liz Hart. This outdoor, walk-about show is inspired by the on-going human impact on the environment. The news is full of worrying stories of climate change, fracking, deforestation, over-fishing, air-pollution, sea-pollution…the list goes on and on. We have made a show that celebrates the diversity of nature, as well as a look at the relationship humans have with the natural world, from the point of view of future travellers, looking back on the time we live in now, while coping with the world they have been born into – the flooded earth of the future. The set is a mobile installation/ship/time machine, manned by two puppeteers/performers who will bring to life the story of their journey from an alternate, flooded future earth. 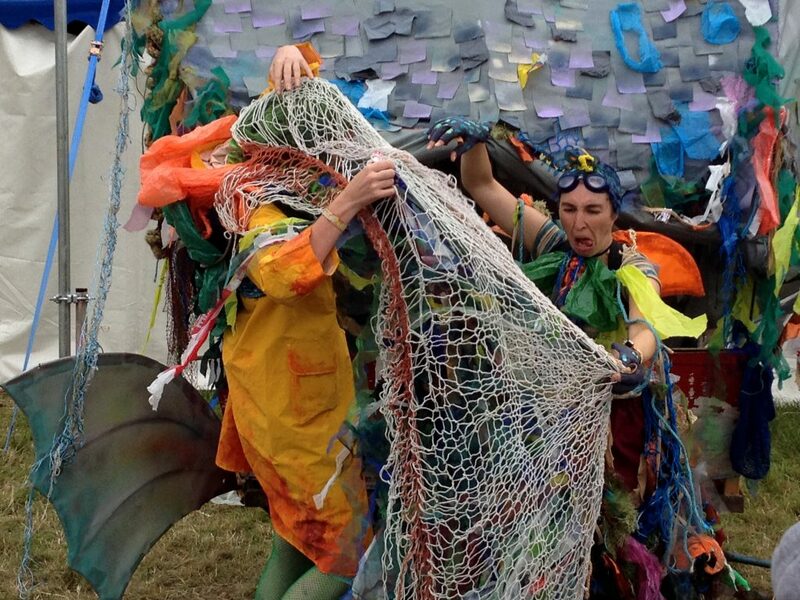 Expect physical comedy, puppetry, clown and talking underwater creatures as we combine the visual theatre expertise of Soup Soap and Lady Strong’s Bonfire with immersive sound design by Chris Menes. The Environs is a roaming and fixed site piece of outdoor theatre, with an environmental theme, for audiences of all ages. Most of the music for this show was based around rhythmic patterns built up from recordings of water. Waves, splashes, drips and drops were arranged into patterns which created a starting point for the rest of the music. The idea was to create the sound of a strange futuristic yet ramshackled sea craft. Shonky old fashioned mechanical noises were utilised, giving the sound-world a sort of steam-punk at sea aesthetic. The melodies are playful and cartoon like and were recorded using an analogue synthesiser. Ocean and ship sounds were used to add further ambiance. Copyright © 2019 Chris Menes Sound Design. All Rights Reserved.